Yes faithful readers, submitted for your eyes is another ds106 assignment, this one focused on taking an image from the Boston Globe’s Big Picture website, and adding either a humorous caption or comment on the image. While it’s easy to make light of some of the images, it’s a terribly difficult assignment as many of the images posted recently revolved around the E. coli scare currently going on in Europe. Farmer’s livelihoods are being dealt a serious blow as many are forced to destroy their crop (seen in the above image), as many Europeans are afraid of fresh vegetables for fear they might be carrying the dangerous bacterium. However, in the interest of learning, it would be interesting to take a series of these photos to create some rather intriguing posters for your classroom, laying out the general guidelines of your learning environment, or perhaps allowing students to create their own “Emily Post’s Ettiquette Book” so to speak. 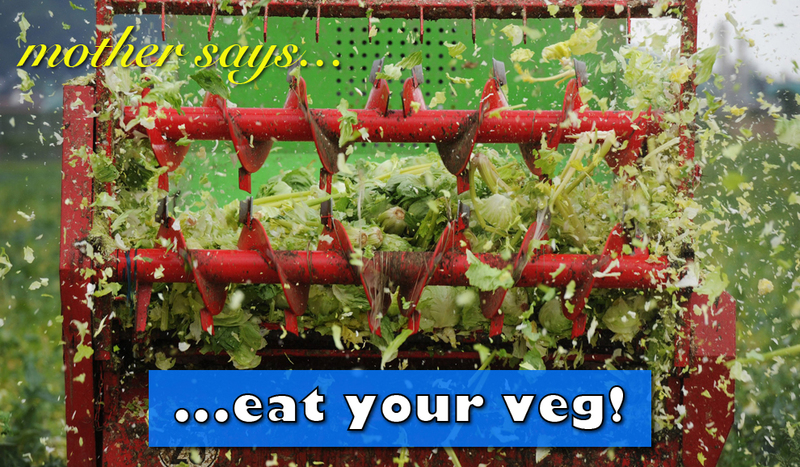 I couldn’t stop thinking about all the cliched lines of “eat your vegetables!” spoken by many mothers around the globe when I saw this image, the large iron teeth tearing the poor cabbage to shreds. At the very least, it would be an entertaining exercise to help “break the ice” the first day of class as you get to know your students. Another way to use images, as well as to use as a first-day icebreaker, would be to have students create a short biographical comic strip talking about their lives. Students and teachers can use my free comic strip generator, MakeBeliefsComix.com, where they’ll find interesting characters with different emotions to choose from, blank talk and thought balloons to fill in with text, story prompts as well as printables. The students can use the characters as avatars for themselves. It gives them a way to combine visual images with writing. While there are many reasons for an increase in e coli. food poisoning incidents, by far the biggest reason is the move to larger commercial farming. The larger the farms, the smaller the diversity that consumers have to choose from. If there are lots of smaller farms providing produce and there’s an outbreak, it affects a relatively small area, but now that most of our grocery stores are using very large commercial farms, outbreaks are spread out over large areas.